People with specific conditions will be allowed access cannabis-based drugs under new proposals. AN EXPERT PANEL of doctors will tomorrow begin to draw up guidelines on how medicinal cannabis can be prescribed in Ireland. Describing it as “a pivotal step”, Health Minister Simon Harris said the expert reference group, chaired by Dr Mairín Ryan of the Health Information and Quality Authority (HIQA), would start drafting guidelines on how the drug can be dispensed. Patients and clinicians will also have a say on the guidelines which are to become the main building blocks of the Cannabis Access Programme (CAP) which Harris announced at the start of the year. The Minister said that those with specific illnesses will be able to access cannabis in the future. The Health Product Regulatory Authority (HPRA) review last month concluded that a cannabis programme could allow access to medication for those with certain conditions. Multiple Sclerosis patients who are resistant to all standard therapies. Chemotherapy patients suffering from nausea and vomiting. Those who have drug-resistant epilepsy. The reference group will be made up of medical experts in oncology, palliative care, anaesthesiology, general practice, neurology, psychiatry and pharmacy to name a few. They will commence work tomorrow on drafting guidelines to facilitate the prescription and supply of medicinal cannabis to qualifying patients. According to a statement released by the Department of Health this evening, the group will “have regard to the HPRA report and other international scientific evidence in developing operational guidelines for the implementation of the access programme”. It is expected the guidelines will focus on the clinical criteria for patient access including forms of medicinal cannabis that will be permitted for use, prescribing and dispensing requirements for doctors and pharmacists, education requirements for healthcare professionals and patients and the ethical implications of the scheme. Harris said that there is no legal impediment stopping him from allowing medicinal cannabis and that he has the power to grant a license to those with certain medical conditions. “It has been reported in recent weeks that there is a legal barrier preventing access to cannabis-based treatments and that a change in the law is required to allow patients to access cannabis treatment,” he said. In fact there is no legal barrier. It remains open to me, as Minister for Health, to consider granting a licence under the Misuse of Drugs Acts, where the proposed course of treatment has been endorsed by a consultant. A licence has been granted for a named patient under this provision. 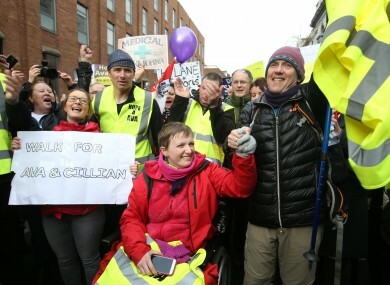 Last week, it emerged how mother and campaigner Vera Twomey intended to hold another protest outside the Dáil saying that “nothing else will do” except new legislation. Twomey, who has come to national prominence for her campaign against what she sees as the denial of treatment for her daughter Ava, says Irish laws make doctors reluctant to apply for a special dispensation. Email “Ireland moves one step closer to allowing doctors prescribe medicinal cannabis”. Feedback on “Ireland moves one step closer to allowing doctors prescribe medicinal cannabis”.